The towering metal fence that divides the United States and Mexico at the edge of the Pacific Ocean has an imposing new feature: row upon row of razor wire. The wire that’s typically used in battlefields and on prison barriers is the most visible result of the $210 million military deployment along the U.S.-Mexico border, creating an imposing sight for the crowd of Central American migrants gathering in Tijuana. 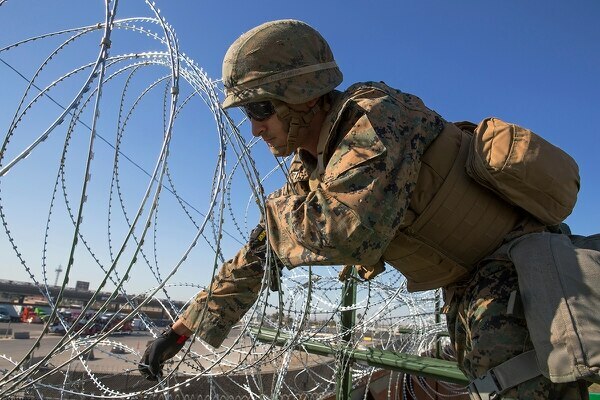 Soldiers and contractors have been installing different versions of the sharp wire barriers all along the border — on the fence, at ports of entry and on the banks of the Rio Grande in Texas to name a few. “This is what it really looks like - no climbers anymore under our administration,” President Donald Trump tweeted along with a photo of the fortified section in Southern California. About 5,900 active-duty troops will spend the holiday working on border security assistance. It is called concertina wire, named after the musical instrument and its expanding and contracting bellows. It resembles barbed wire that's commonly used to corral cattle, but it comes in flat coils that can quickly expand like its namesake, making it easier to store, transport and install. It has been the wire of choice for militaries around the world since World War I. 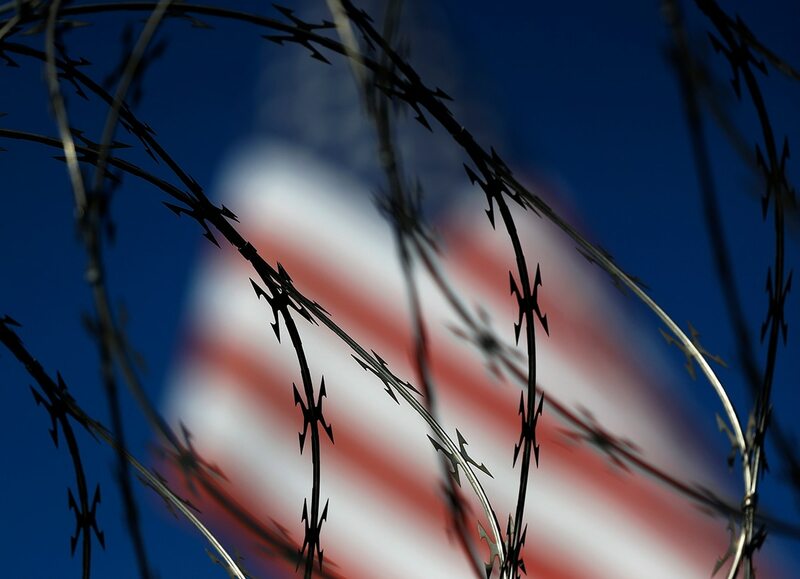 Made in factories today using galvanized steel, concertina wire consists of sharp flat blades. It's used to secure businesses, prisons and other government installations. Critics have blasted Trump’s military deployment at the border as an expensive political stunt — and question why active-duty troops are needed for tasks that contractors could perform. According to figures reported to Congress on Tuesday, the Pentagon estimates the cost of the military's mission on the U.S.-Mexico border will be about $210 million under current plans. That includes money for active-duty troops and National Guard troops. What's not clear is how much has been spent on materials like razor wire. A ton of razor wire can go for several hundred dollars while a single roll can be bought online for as little as $30. 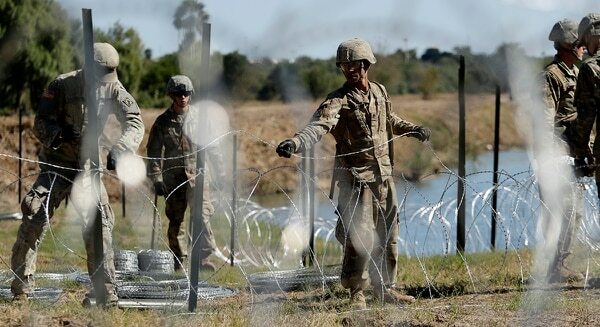 An initial 22 miles (35 kilometers) of concertina wire was shipped to the border when the first troops began to deploy to California, Arizona and Texas a month ago. Military officials said at the time they had more than 150 miles (240 kilometers) of wire available. It's clear it won't be strung along every mile as it would take 13 times that amount to span the U.S.-Mexico border. The border stretches about 1,950 miles (3,138 kilometers) from the Pacific Ocean to South Texas where the Rio Grande dumps into the Gulf of Mexico. It's up to U.S. Customs and Border Protection to tell the military where to put the wire. U.S. Defense Secretary Jim Mattis has said the short-term objective has been to get enough wire and other barriers in place as requested by border officials. A Defense Department spokesman, Army Col. Robert Manning, told reporters earlier this week that more than 4 miles (6.8 kilometers) of wire obstacles had been installed by soldiers in Arizona and California. The focus has been in the San Diego area, where it can be seen by migrants waiting on the south side of the border. It also has been put up at the Otay Mesa port of entry in California and at less populated spots near crossings in Nogales and Douglas, Arizona, and in Laredo, Hidalgo and Brownsville, Texas. 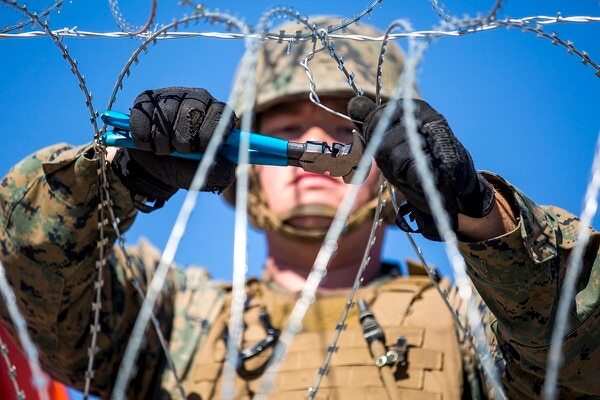 Combat engineers — whose duties on the battlefield include setting up tactical obstacles to prevent the enemy from moving freely — are using their expertise to string wire on border walls and to erect temporary fencing. Forklifts, tractors and other heavy equipment are used to move the coils to where the wire needs to be installed. Wearing heavy gloves, crews space out the coils as if they were stretching a toy Slinky and the concertina is then affixed to the tops of walls or fences using bits of wire. In some spots, metal stakes are driven into the ground and used to support the wire. U.S. Customs and Border Protection released video last week showing a man cutting through wire that border agents had placed just hours before on a fence near Yuma, Arizona. Arizona Border Patrol agents for several months have been overwhelmed by the arrival of large numbers of Central American migrants traveling as families. During a 48-hour period last week, agents in the Yuma area apprehended more than 650 people who crossed illegally. Customs and Border Protection officials have argued that additional barriers and the deployment of National Guard and military troops have helped to free up agents.